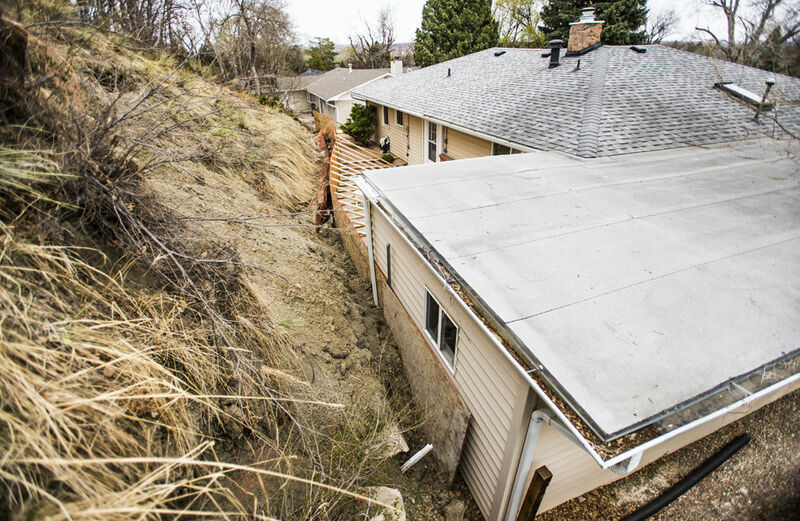 Rick Sisco's home in the Skyway neighborhood faces an extreme landslide, pictured on Friday, April 8, 2016. Photo by Stacie Scott, The Gazette. A landslide advances on the home of Gail Meires in the Skyway neighborhood on Friday, April 8, 2016. Photo by Stacie Scott, The Gazette. The home of William Farkas has been condemned due to landslide in the Skyway neighborhood, pictured on Friday, April 8, 2016. Photo by Stacie Scott, The Gazette. Elevated ground at the Broadmoor South Golf Course is evidence of landslide activity, pictured on Tuesday, April 26, 2016. Photo by Stacie Scott, The Gazette. Rick Sisco has a panoramic view of the city and mountains - and a sheer, 20-foot cliff in place of his front yard and patio. Sisco's house on Constellation Drive once sat atop a hill. Now it's perched on the edge of a canyon. The house is at the head of a landslide that he first noticed on July 6, after record rains in May. 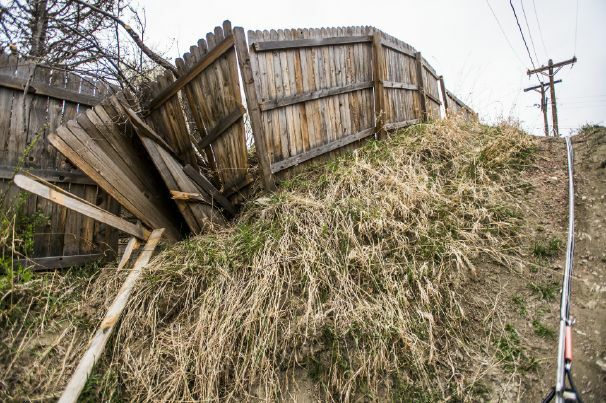 He's among about 80 local homeowners seeking relief from the Federal Emergency Management Agency for home damage, and he's likely to be high on the priority list in Colorado Springs. "This isn't devastating," Sisco said during a recent interview. "This will take $150,000 out of our life savings. But if I have 70 percent of this house (compensated by FEMA), I can buy another house. "I'm physically blessed, and so far I'm able to live here." He's been tracking the slide's movement and resulting canyon daily, though, even as a sidewalk from his front patio tumbled into the depths below. The slide had traveled 17 feet since last July 6, he noted in late April. "It's moved 5 inches since March 10. Twelve inches in seven weeks." His wife continues to operate a daycare center in their home despite the damage. Since they bought the house in 2011, Sisco said, his favorite holiday has been the Fourth of July. Fireworks displays throughout the area could be seen from his front patio, prompting him to have a huge celebration on the 2015 holiday. This July, though, a party is unlikely. His front yard now is at the bottom of a canyon. 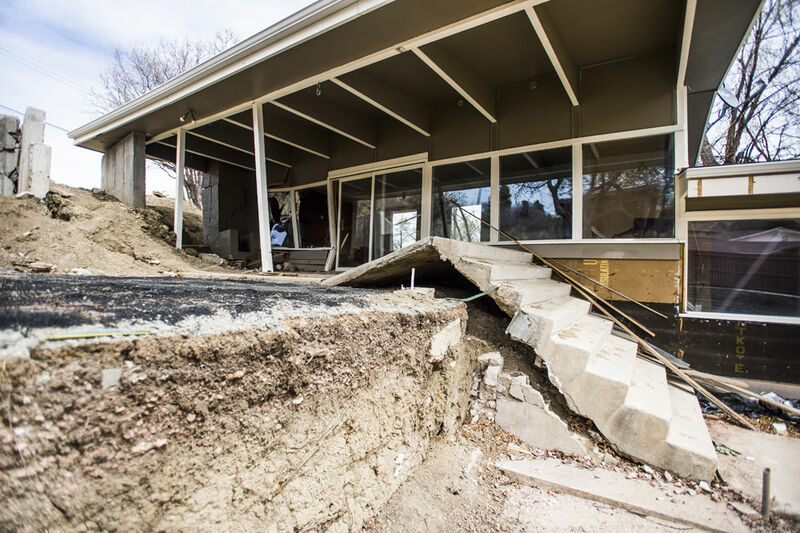 With her 88-year-old mother terrified at the prospect of being buried alive, Gail Meires took her and fled their home on the Zodiac Drive landslide on March 19. "It's causing a lot of emotional damage for my mother," said brother Joe Meires. "She was afraid the whole thing would come down at once and bury her alive. She just couldn't be convinced that wouldn't happen." "It's going to hit, I know," Gail said. "The next time you see the house, you may not see the back end of it." Still, she said, "We're one of the lucky ones. My mother and father didn't have a mortgage." 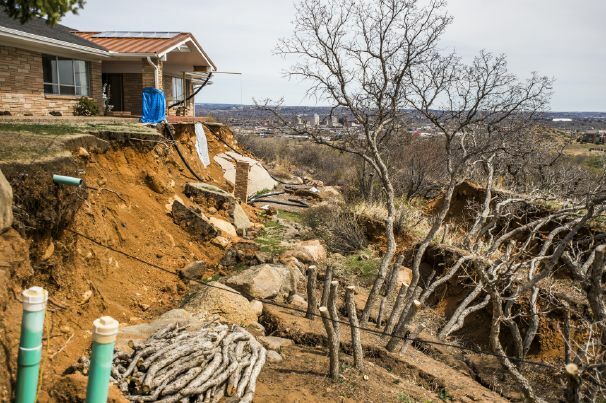 The house is on the list of about 80 Colorado Springs homeowners seeking buyouts from the Federal Emergency Management Agency. It's going to be condemned, Joe said, so his brother in construction wanted to remove and recycle the fixtures. "He was told he couldn't do that because it would lower the value of the property. That's beyond our understanding, because the property has no value anyway. "Our concern was to get my mother into a safe place. My mother's house is the toe of the slide... So that's why they no longer live there." 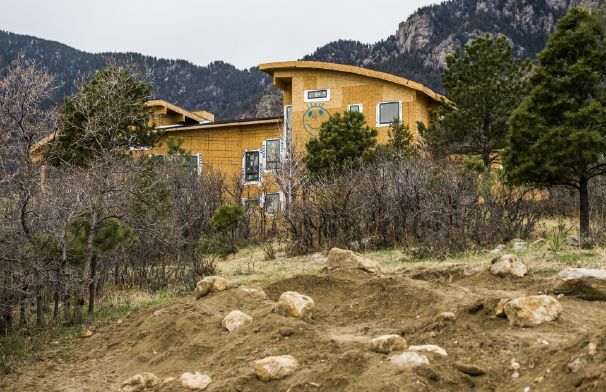 Trying to sleep at night, William Farkas could hear the walls "creeping and cracking and busting" last summer in his now-condemned house on Zodiac Drive in the Lower Skyway neighborhood of Colorado Springs. "Your house is just crushing down on you. My (15-year-old) son's bedroom was downstairs. I made him move to the other side of the house. And three weeks later, I moved to the other side," Farkas said. "I'm smack dab in the middle of the landslide. I'm getting the whole brunt of it. . If I saw a geologist's report that there's a 100-year-old landslide there, I would have never bought it. Never." The city doesn't provide such reports, though. At best, plat papers included in a buyer's closing documents will have a note saying a geological hazard report exists, said Peter Wysocki, director of the city's Planning and Development Department. Farkas bought the house for $400,000 in 2011 and spent $250,000 installing a new furnace, windows, oak flooring and a $30,000, five-star kitchen. He was ready to put it on the market the next day for $535,000. "I saw a crack in the back, and that's where it all started. I said, hold off, I'm going to fix this for the next owner." He spent $10,000 to excavate and fix the cracking foundation. "Then everything started happening," Farkas said. "That foundation wall in the back started cracking. My stairs started going outdoors. I spent another $25,000." The neighborhood landslide, thought to have been triggered by record rainfall in May 2015, still is moving and growing. It grew through last summer as Farkas searched for a rental that would allow dogs. "The house you put your love and money and everything into, it's definitely depressing," he said. "It's a huge financial burden. You've got to move. You move into smaller house. You have to put furniture into storage units. "I don't even go to that house anymore. My wife and I will not drive over there." The family moved out in August, but Farkas is paying the mortgage on a house facing demolition. "People still need their paychecks," said Farkas, who owns four Fat Boys Pizza stores in Colorado Springs. "I have 32 employees; I've got to make sure they're taken care of too. "I think the only reason I have some sanity is because I did leave. Even though I'm in a cramped house, and it's not yours, I think that's the only thing that's saved my sanity. "Those people still in it are in a way worse position than I am. I feel so sorry for them." 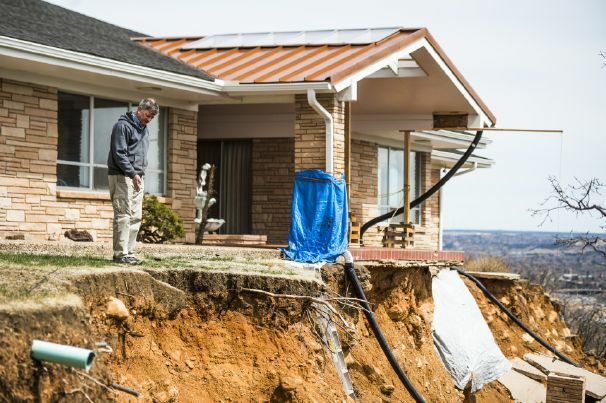 Jack and Helen Spencer's villa near the Broadmoor Mountain Golf Course in Colorado Springs had to undergo about $75,000 worth of shoring up as a landslide in the area continues to move. "I'm glad you're calling because nobody has noted anything in Broadmoor Resort," Helen Spencer said. "We're the only unit in that community that is affected where we've actually had to do something to the home to shore it up. "Some other properties are dropping off on the back, but they haven't done anything." A property owner in nearby Stone Manor Heights is doing something, though. 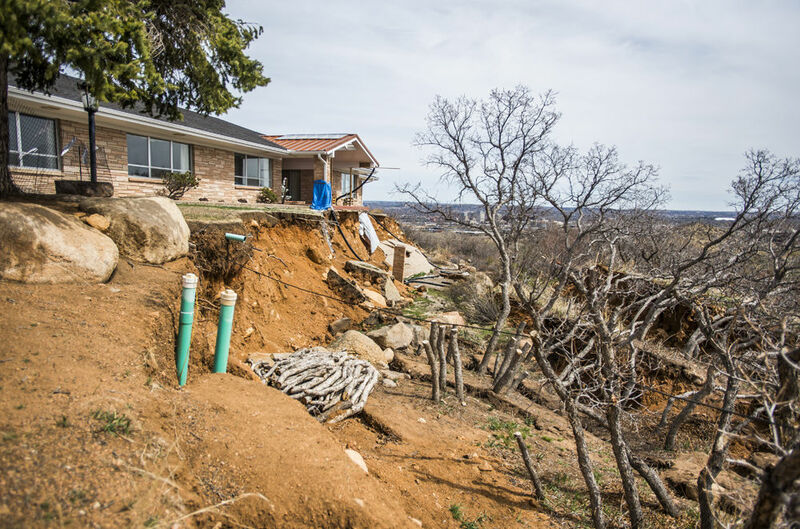 Judith Myklak filed a notice of claim saying that water leaking from pipelines of Colorado Springs Utilities caused the landslide that damaged her property last summer. She is suing for damage to two properties on Stone Manor Heights. One had a $3 million house before the landslide; now it's valued at $300,000. An adjacent lot was valued at $575,000 but now is "essentially worthless," her suit says. A civil engineer she hired estimated that emergency mitigation on the lot would cost about $217,000, and restoring it could range from $1.8 million to $10.8 million. Myklak could not be reached for comment. The Broadmoor hotel and its COG Land & Development Co. also filed a notice of claim in November about Utilities' broken water pipe, but that was strictly for insurance purposes, Broadmoor Chairman Steve Bartolin said Thursday. "Anything that may or may not be related, we have to make notice of that and protect that as part of our responsibility to our insurance company," Bartolin said. "Not being a water expert or utilities expert or geological expert, I think common sense would prevail: an 8-inch water line vs. a record rainfall over a couple of weeks period. And you look at all the other damage that occurred up and down the Front Range (last summer), I think it'd be hard to argue it was the fault of the water line. "That storm was record-setting and caused a lot of harm." Utilities spokesman Steve Berry agreed that the real culprit was soils saturated by the nonstop rain that fell in May. An 8-inch diameter water pipe that Utilities owns broke last April or May and then again over the Fourth of July weekend, Berry said. The shifting earth likely caused the breaks, but the leakage was minimal, he said. "All of that is because, basically, the whole mountain is moving over there. Everything is eroding away, which is why those pipes are now above ground." The black pipes, stretching 2,000 feet in all, flank Myklak's house at a distance. They had to be placed above ground, in cooperation with The Broadmoor, to reconnect the Penrose and Fisher reservoirs. The ground is moving too much to rely on the subterranean pipe, Berry said. It's also moving too much to reopen the golf course, Bartolin said. Outside her house on Manor Gate Point, meanwhile, a crack extends through the earth straight into the golf course, Helen Spencer said. She said the couple has worked "tirelessly day after day" to check for cracks in their home since the 2015 rains. The house was insured through a $50 million homeowners' association policy with Lloyds of London, she said. "We have huge HOA dues, and we're not getting anything for it," Spencer said. "They dropped the insurance three years ago. Everybody assumed at that juncture that the HOA had done something to take care of the insurance. They have not. You can get insurance for everything but what we need." "We are 76 and 79, and this is our retirement home. We are the only ones, to our knowledge, that have put the work in. . "We've owned (homes) in two places for 40 years now, and we're going home to a house that's worth zero." Gazette reporter Maria St. Louis-Sanchez contributed to this report.